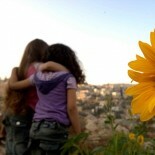 Locals in the West Bank tell EAs that there are frequent child arrests there. Today we travelled to a village on the outskirts of Bethlehem to hear 18-year-old Yasin* tell his story. Yasin was arrested when he was 15 years old and released from youth detention in August 2017. He served three years. Questa voce è stata pubblicata il 11 ottobre 2017 da orybal in libertà.